announce Autocapper – a new affordable microplate sealing system designed to work with reusable mat caps (friction seals) from all the major manufacturers. Set-up to quickly and securely seal 96-well deep well microplates as standard, the Autocapper is compatible with shallow well and several other plate formats (24-well, 48-well) using a range of supplied adapter blocks. Designed to meet the needs of laboratories for low to medium throughput microplate sealing, the Autocapper is compact and easy-to-use. With just a touch of a button, the powerful, yet smooth operating mechanism makes single action sealing of microplates quick and simple thus removing any risk of Repetitive Strain Injury (RSI). 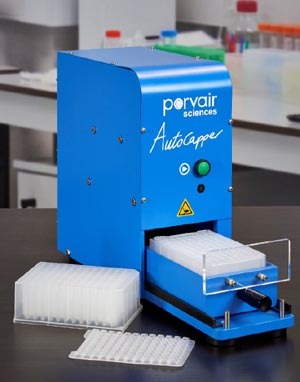 With its small footprint, operational simplicity and ability to handle a wide range of microplates, the Autocapper is the obvious choice for laboratories looking for an affordable manual sealer.